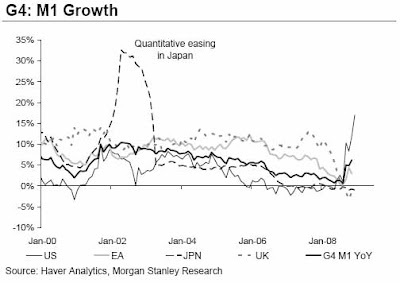 Reading some GS equity weekly data. 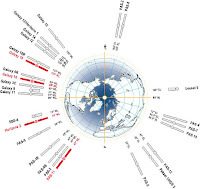 Key charts are presented below. When I discussed the basis trade opportunity, the conclusion was that arbitrage in the secondary (and by extension primary) market exists due to significant dislocations in liquidity. Sure, one can argue that immediate culprits for the arbitrage have to do with counterparty risk and funding costs, which makes sense, but those are merely derivatives of the liquidity disconnects between different brokers, their accounts, and any permutations thereof. The problem with the basis trade, as Merrill and many others experienced, is that in the period of time before its par unwind, a lot of crazy stuff can happen that can force stop losses triggers, significant margin calls, and the overall liquidation of your business. One thing to note is that virtually any account which trades fixed income can participate in the auction, it is not limited to parties which have preexisting CDS relationships with the defaulted entity. 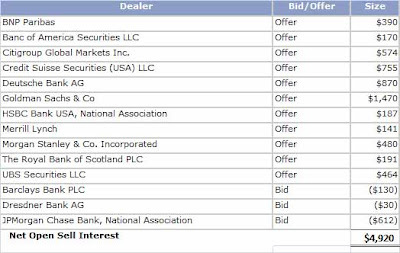 A few days before the auction ISDA prints the list of deliverable obligations that will be allowed to settle physically - many times these are most of the corporate bonds of an issuer, but in some very complex cases (Lehman and FNM/FRE most notably) only a certain percentage of bonds are selected. The day before the auction, ISDA publishes the full list of participating bidders which will serve as the clearing agents to make sure all offers are exhausted. On the day of the auction many things happen in rapid succession. The key items to keep track of are the submission of the amount of bonds one is willing to purchase and at what price, the determination of open interest (amount of bonds that have to be purchased in the auction by various dealers), and the final price, which Creditex posts at 2 pm on the auction date, which is also the close of the auction. It is important to understand that physical settlements are Dutch auctions: i.e. 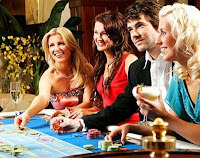 clearance occurs at the lowest price at which all net sell interest is absorbed. Therefore, a bidder does not stand to lose by placing a low ball bid as it may very well end up the critical one, and result in the final price. After dealers submit preliminary inside bid indications, they are allowed to participate in the auction. The final bid price is based not on the inside bids but the actual limit orders (a combination of broker and customer orders) at which the Dutch auction clears. The next important step is determining the Net Buy/Sell interest. As noted, most auctions are entered into with a net open sell interest due to excessive protection selling which is one of the main reason for the arbitrage. As presented, in the Lehman case, despite nearly $150 billion of defaulted unsecured debt, there was only $4.9 billion in net open interest (offered), proving all doomsayers of the CDS market wrong, as at its core it is a fundamentally very efficient market, regardless if it trades OTC or on an exchange. After the net open interest is calculated, bidders submit limit bids which is where the liquidity arbitrage truly comes into play. The Lehman auction is probably not the best example of the arbitrage as two of the bidders had market-conflicting interests, although it will still demonstrate the point (Barclays which had legacy interests from its Lehman broker/dealer acquisition, and JPM which had the government's backstop at this point and likely other derivative interests in clearing bonds at a certain price). 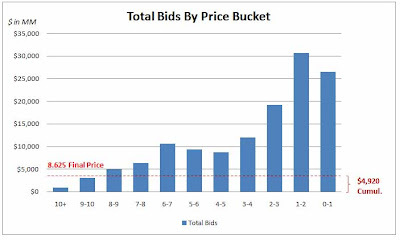 The chart below shows the cumulative total bid interest by pricing bucket (again for the full backup check out the Creditex link above). Notable here is that the preponderance of bids are at ridiculously low levels, with the average of the total $132 billion notional in submitted bids (which is surprisingly close to the total amount of outstanding debt - perhaps dealers and accounts had assumed that as much as the total unsecured debt may be open to physical settlement) in the 2-3 cent range. Obviously many bidders were focused on the Dutch aspect of the auction, trying to aggressively lowball the market. 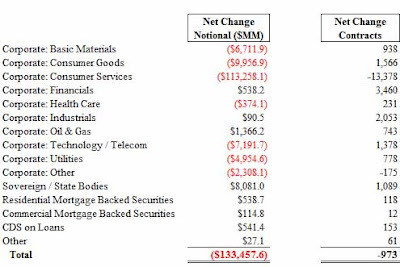 As the final net sell interest was relatively low in comparison with the total bid interest, $4.9 Bn vs. $132 Bn, the clearing price was higher than the average. However, as mentioned above, JPM and Barclays, which likely had other motives in terms of procuring Lehman securities, alone accounted for $2.5 billion of the $4.9 billion in effective bids. Without these the final price would have had a 7 handle. 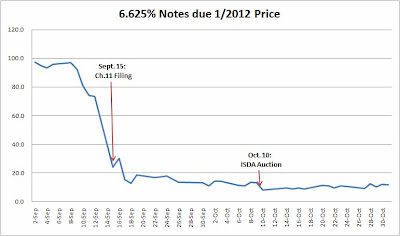 As representative Lehman bonds had been trading in low teens (in this example the 6.625% Notes closed at 13 on October 9, the day before the auction, according to TRACE) the highest bid bucket will almost certainly be below the market price. And this is where the arbitrage comes into play. Managers who wish to enter a specific bankrupt security don't have to buy it in the open market if there is an ISDA auction approaching - they merely have to submit a reasonably discounted bid in the ISDA auction in order to be able to purchase the security, by taking advantage of the liquidity dislocations in the market. Here, the ISDA clearing price of 8.625 was about 35% lower than the prior closing price (13) for an indicative Lehman issue which was a deliverable. This is also sometimes called the cheapest to deliver phenomenon as the clearing price will very likely always be lower than the market price of the cheapest trading security in the secondary market that is part of the deliverable schedule per ISDA. The liquidity part of the equation comes into play when one considers that fewer and fewer dealers and funds have lots of spare cash lying around to participate in these kinds of auctions. Once an account submits a formal bid (bid and notional), it is binding. Which is why in many of the upcoming ISDA auctions (Lyondell will likely be the most anticipated one) a buysider may make off like a bandit merely by submitting a large, substantially out of the money big which gets triggered when the Dutch auction doesn't find filling bids on the way down. Admittedly, there are many more nuances to the physical settlement process (could discuss offline time permitting), but in a nutshell it is a great opportunity for still liquid accounts to purchase bonds in bankrupt entities at a significant discount to market values. If one chooses so, these may be flipped immediately in the open market which still trades substantially higher than the auction results (in Lehman's case on the day after the auction, the 6.625% bonds closed at 9.6% allowing for a 10% return in one day). There are odd exceptions: the Fannie/Freddie physical settlement auction ended up in some surprising results, where due to technical considerations, the subs ended up with a higher clearing price than the seniors (there is good literature out on the net as to why this happened). Additionally the final auction Creditex document provides some very good insight into which broker/dealers may have liquidity constraints. The Lehman auction specifically demonstrated that Morgan Stanley is severely strapped for cash: despite their inside bid/offer levels of 8.25/10.25, they indicated firm limit orders only below 5 cents. The upcoming auction results will provide a rare glimpse into just how cash limited (or not) broker dealers are currently: I would keep an eye out on Goldman, Morgan Stanley, Merrill and RBS. If the liquidity malaise is indeed spreading, funds will be able to take advantage of the brokers' troubles, and purchase securities at some very significant discounts to prevailing market rates. First Geithner, now this. In a developing story, Obama's pick for Secretary of Health and Human Services Tom Daschle is apparently on the outs with the IRS as well. The issue this time has to do with a car and driver lent to Daschle by Leo Hindery of InterMedia Advisors, and former president of YES network, whose use the former Senator never declared on his 1040. Apparently the ex-Senator started working on the executive board of InterMedia in 2005 after his failed re-election campaign, and at that time began using the services of Hindery's car and driver, without declaring this as the law requires. Tom ended up having to voluntarily pay back $101,943 in taxes and interest for the 3 years of unreported use. And of course, Daschle is quoted as saying that "he deeply regretted the mistake. When he realized it was a mistake he corrected it rapidly." It seems that, unlike Geithner who blamed the mistake on stupid TurboTax, Daschle had been using an accountant, and when the issue was brought up in 2008, the latter said "there could be tax consequences." Good to see he earned his pay. Also, turns out this is not the only post that Daschle is appointed to. If the unimaginable happens and he is actually held accountable for his fraud, unlike the Treasury guy, he can always fall back on the other post that Obama has appointed him to serve on: Director of the new White House Office of Health Reform. Can we amend McCaskill's communist bill such that in addition to capping all compensation at $400,000, that no Americans have to pay taxes just like more and more enlightened representatives of the ruling class. The only man with cojones to call the depression a depression, David Rosenberg, of what is now Bank of Countrywide Lynch, is reading behind the BS that was this morning's highly suspect GDP number, and expects the current quarter's annualized GDP decline to hit -6.3%! The two items that attract his attention are consumer and capital spending, declining 3.5% and 27.8%, respectively. 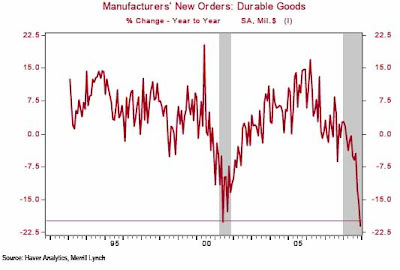 So where did the fudging occur to result in the upside surprise: inventories. While consensus was expecting a $100 billion reduction in inventories, the number was in fact an addition of $6.2 billion. Ironically, despite all the massive inventory liquidation efforts at domestic businesses, shelves are still stocked to the brim, and that $1,000 Barney's suede jacket is still on the shelf, now selling for $29.95. David's conclusion: the first and fourth quarters have changed places, and more relevantly, "the Obama team's fiscal stimulus package, when it does start to percolate by the spring, is going to be launched from a much deeper hole in the overall level of economic activity." 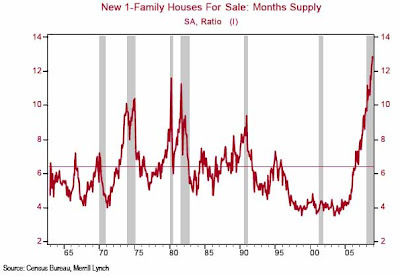 Not until we get this inventory-to-sales ratio below 8 months' supply can we expect this three-year deflation episode in residential real estate fully play out. At the current pace, and assuming the builders remain aggressive in curbing production and sales don't go and make even new record lows, it will take a good year for supply and demand to come back into balance. Until that happens, we are likely to see another 15% downside to nationwide home prices, on top of the unprecedented 25% slide already incurred by the Case-Shiller index. 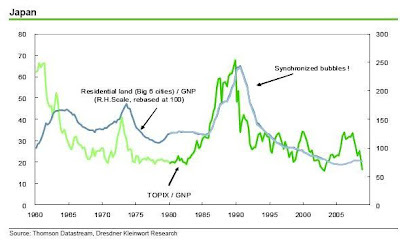 This is an amount significant enough to not only wipe out the remaining capital base of the large banks, but also double the number of mortgage borrowers who are currently in a negative equity position (ie, to 25 million out of a universe of 51 million; we can thank Gary Shilling for those statistics). 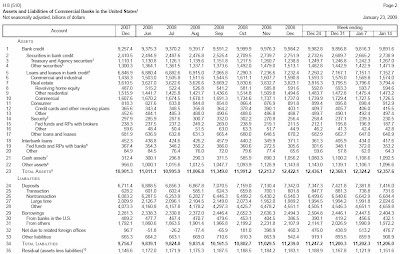 This would only reinforce the severe trauma that has already hit the US household balance sheet – a $13 trillion loss of net worth since the third quarter of 2007. And if our assessment of where asset values are going is correct, then that cumulative loss will approach $20 trillion by the end of 2009. With the lags, such a hit to wealth would imply more than a $300 billion or 3% annual decline in real consumer spending annually for the next three years as the savings rate climbs back to its pre-bubble normalized level of around 10%. This is what the TARP(s), the fiscal package and the Fed's repeated liquidity backstops are up against. 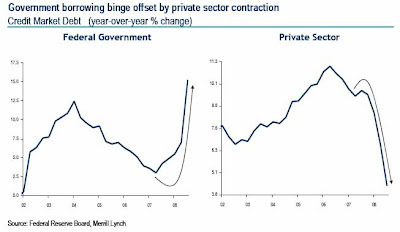 So far, the battle between the expansion of the Federal government's balance sheet and the contraction in the private sector balance sheet is being won by the private sector. Total credit creation in the economy, even in the face of a near trillion dollar fiscal deficit (and growing), has slowed from 9% to just 6% as the consumer deleverages (a record $29.3 billion of household debt was paid down in 3Q and the monthly data show a repeat in 4Q) bumps against the Federal government largesse. 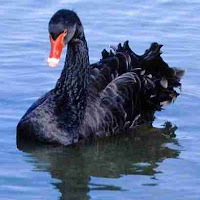 Nassim Taleb of Black Swan and fat tail fame, has created a Facebook site called "Make Bankers Accountable." It is feasible that this could become the 21st equivalent of the million man march on Washington. We fully endorse the initiative. Maybe eventually Obama will realize just how angry the general public is becoming. Paul Kedrosky has captured some great statistical data from mint.com about how the average U.S. consumer is faring. In a nutshell - plain horrible. 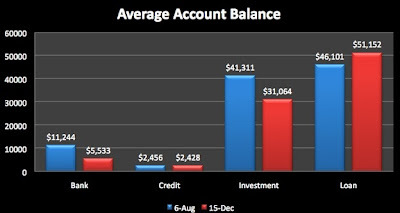 From August to December, the average savings account was halved to $5,500. Fortunately, credit card debt remained roughly constant, but investments declined by 24%, while loans (mortgage, HELOC, student loans, and personal loans) increased by 11%. … But what the data, the hard facts, mean for you – if you run a consumer business – is that your customers are spending $400 less each month than they were a year ago, have burned through half of their savings, and on average have taken on an additional $5k in debt. Here we toast to the U.S. consumer... his insane spending habbits shall be missed. Breitbart reports that the Feds foiled an attempt by a disgruntled former employee to destroy all the data on Fannie Mae's 4,000 computer servers nationwide. Apparently 35-year-old Rajendrasinh Makwana decided that the best way to deal with the ongoing depression is to give everyone a fresh start and delete the mortgage files for a large number of U.S. residents. He was going to distribute a computer virus in the Fannie computer network that would destroy all of Fannie's data. Yes, this guy is small time, ripping off people for "only" $6.5 million, but his approach is unique. 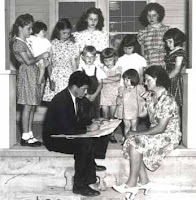 In the SEC complaint filed against Nashville, TN advisor (who is not registered as an advisor anywhere but presented himself as one), Gordon Grigg and his firm Pro Trust, the mini-ponz took investors money "and misrepresented that their money was invested in the federal government's Troubled Asset Relief Program (TARP) and other securities that, in reality, do not exist." Seems the next wave of ponzi is taking taxpayers' money to (not) invest it in taxpayers' money... Oddly elegant when one thinks about it. 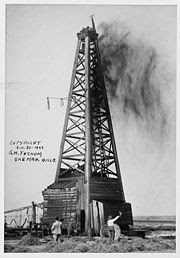 In an 8-K filed yesterday, Edge Petroleum announced what many had known for a long time, that it may filed for Chapter 11. Earlier the company had hired restructuring law firm Akin Gump to advise on financial and strategic alternatives. On January 8 credit facility agent Bank of California essentially pulled the plug on the company when it lowered Edge's borrowing base to $125 from $240 million, which immediately put it in technical default as its L/Cs and outstanding were higher than the borrowing base by $114 million. In the 8-K, Edge states "there can be no assurance that the Company will reach [an] agreement with its lenders with respect to any restructuring and if not, will be able to make the required payments with respect to the Deficiency when they become due. Moreover, there can be no assurance that the Company’s ongoing efforts to evaluate and assess its various financial and strategic alternatives (which may include the sale of some or all of the Company’s assets, the merger or other business combination involving the Company, restructuring of the Company’s debt or the issuance of additional equity or debt) will be successful. If such efforts are not successful, the Company may be required to seek protection under Chapter 11 of the U.S. Bankruptcy Code." Another Major Leg Down In Real Estate Coming Up? Thanks to FT Alphaville for catching these bad boy charts. 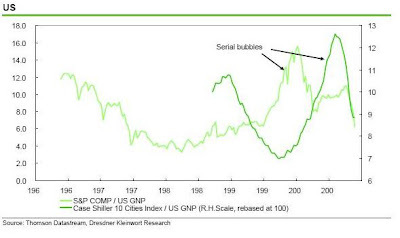 The article discusses the formation of serial bubbles in housing and equities in most countries except in Japan, where the bubbles were synchronized. 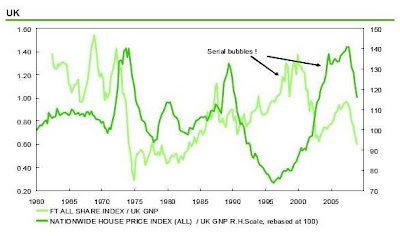 And based on a historical ratio of house prices to stock market levels, either real estate still has a long way to drop or markets are due for a significant rally; as to which is more likely, reference any day's headlines. GDP: Q4 annualized report out at 8:30 am: Consensus at -5.5%, Actual at -3.8%: someone forget to carry the 1? Anyone know what if any seasonal adjustments go on here? Is Fortress Investment Group On The Edge Of Insolvency? How the mighty have fallen. According to Bloomberg, Fortress (ticker: FIG), which was the first hedge fund to IPO in the heydays of the credit bubble in the summer of 2007 is trying to raise $80 million to fund margin calls associated with its investment in Gagfah, a German residential property operator, as well as two other real estate investment funds, Eurocastle and Nationstar. Allegedly the margin calls have occurred at the Fortress Investment Fund III, a $2 billion real estate pool raised in 2004, however as Fortress (whose shares last traded at $1.34/share or a 93% drop from its IPO) has already called all the capital from Fund III, according to Bloomberg, it is likely that there is essentially no cash left anywhere in the organization for intercompany transfers. 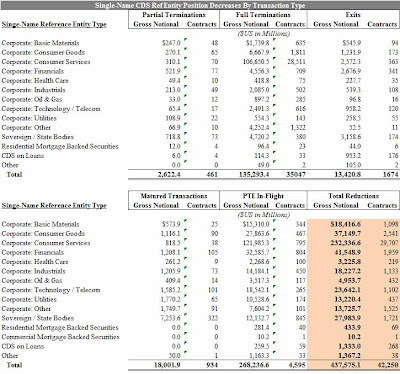 In what many expected to be a test of whether financial companies can raise capital without the implicit guarantee of the government, Goldman managed to price $2 billion of non-FDIC insured notes at 500 bps over comparable treasuries. In absolute terms, the notes priced with a 7.5% coupon to yield 7.779%. While the rate is high, the fact that it could even price is notable as all capital raises by financial institutions in recent months were backed by the full faith of the Federal Reserve's printing presses. The pricing is even more remarkable as today GS stock is down a little over 5%. Intelsat came to market in a Goldman Sachs syndicated bond offering for $400 million of 8.875% Senior Notes due 1/2015. The B3/BB- issue for reference entity Intelsat Subsidiary Holding Company, had been upsized from $200 million, and was snapped up due to its original issue discount, pricing at 88.5% for an 11.6% yield. The proceeds will be used to pay down existing debt. The bonds subsequently rose to around 92 despite a declining HY market, with the HY11 index dropping 2 points to 74.5. This is yet another datapoint that the HY primary market is alive and well as PMs are sitting on piles of cash which they are willing to invest in reasonably risky names. Textron, the owner of business jet maker Cessna, posted atrocious results early today. Stock was down 30% at last check... This is unfortunately in line with our expectations that nothing good awaits the private jet maker and its peers. What Is Perella Weinberg's Compensation Structure? As Dealbook reported previously, Perella Weinberg, the advisory/investing company headed by former Morgan Stanley Chairman of Investment Banking Joe Perella, has been retained by the FDIC to "advise on transactions and strategies to stabilize the banking system, and also on the proper way to dispose failed institutions and how to handle delinquent securities assumed from banks, as well as the creation of the aggregator bank." As these are essentially the core components of whatever the ultimate strategy to extricate us of the current (mini) depression, it seems that U.S. taxpayers need to be kept in the loop on this one a little more actively. Jason Cave, senior advisor to FDIC Chairwoman Sheila Bair said Perella would "bring a different perspective, to make sure our process is fully informed, that we've considered all possibilities." We agree that the wealthiest Italian American has experience working with toxic assets, as he advised on the Bank of America takeover of MBNA and is likely quite familiar with the acquiring company, which as we all know, is currently in a world of toxic pain. But back to the disclosure issue - as Perella Weinberg will be paid to essentially shut down banks and other institutions, and thereby lead to even more job losses, it only makes sense to fully disclose the firm's compensation structure to make sure that its interests are not 180 degrees misaligned with those of the people who are potentially about to be sacked by Mr. Perella. Furthermore, Mr. Perella is the proud owner of Xerion Capital, a distressed billion dollar hedge fund, which he acquired a little over a year ago. While we have no doubt there are some substantial Chinese walls in place at the company's HQ at 767 Fifth Avenue, it might make sense to disclose what all the holdings of this hedge fund are, to avoid "conflicts of interest." Jason Cave has denied to disclose Perella's compensation structure. We suggest the FDIC follow in Tim Geithner's steps from last night, and start providing long overdue transparency to the process of "bailing out" the U.S.
Bill Gross, manager of PIMCO, the largest bond fund in the U.S., issued his February investment outlook today. 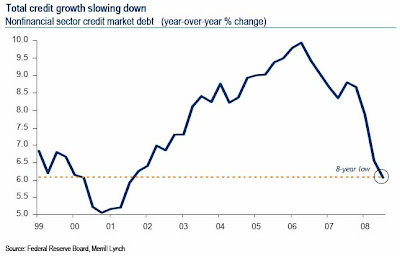 His main argument is the following "To PIMCO, the remedy for this deflationary deleveraging and mini-depression is simple and almost axiomatic: stop the decline in asset prices." (ed. "mini" depression? Looks like Bill won't go full Rosenberg on this one). Without saying anything new, Gross is advising the Treasury, Central Bank, i.e. the U.S. taxpayers, to buy cheap assets (presumably ones in which Bill is axed himself). Not surprisingly, PIMCO was one of 4 funds picked in December to purchase mortgage-backed securities, and one of the managers selected to run the CP funding facility, and of course, was a top contender to purchase toxic debt under TARP before Hank Paulson scrapped that idea. In the spirit of increasing transparency, it is interesting just how much of these securities Bill has purchased ahead of time for his own book? But we digress. Bill concludes "PIMCO’s advice to policymakers is as follows: you can’t bail out everyone, yet economic recovery is not possible unless certain critical asset sectors are not only reliquefied, but rejuvenated in price. Capitalism at its philosophical and practical center depends on credit, and while new loans can be and are being advanced via the banking system, it’s a much more difficult task to force shadow banks to lend. That lending depends on securitization which in turn depends on stable and eventually higher asset prices than currently exist." Ok, we get it and we like it, but as hard as we try, we can't help being cynical in asking just how much of a benefit for his investors (and himself personally) would Bill reap as the U.S. uses taxpayer money to purchases these "cheap" security classes. CNBC just broke the news that Senior VPs and Managing Directors will get no bonuses this year, and next year the bulk of bonuses will be in stock. Lastly, there will be a bonus clawback provision: If UBS has a loss over a three year period, no bonuses at all will be paid. 5 day Ruble chart presented without comment. When we inducted Artridis Barracuda in our "coolest name of all time" hall of fame, we had no clue just what a powerhouse this fund is. Turns out the intellectual capital behind the company, in addition to coming up with insanely cool sounding names, also knows how to turn a profit. 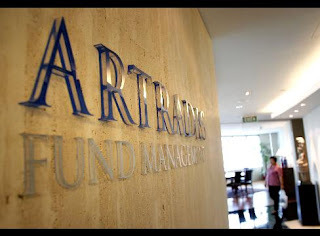 Artridis, which is Singapore's biggest hedge fund firm, apparently has $4.5 billion in AUM, manages the $2.4 billion Artridis AB2 Fund managed by Stephen Diggle and Richard Magides, and the $1.8 billion Barracuda. The two funds returned 35% and 27%, respectively. The fund's strategy apparently is volatility, which the managers capture via options, warrants and converts. In another take on the previously discussed basis trade topic, a curious statistic that few have paid attention to is the significant premia new issues have offered to existing comparable CDS spreads on the same issuer. 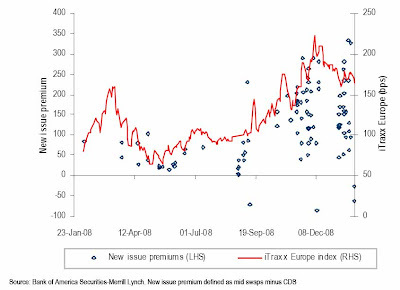 The definition of the new issue premium is the spread of the new issue versus the matched maturity CDS spread. Whether it is a function of the basis spread aberrations in the secondary market, or just a method to incite existing CDS holders, or any other potential purchasers to purchase new issues (with a free hedge) is not sure, but seems to be the norm over the past several months. 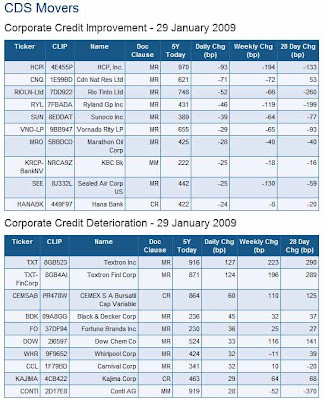 Empirically, new issue premia have increased over the past 6 months, and even as spreads have tightened overall, some of the most recent market new comes have come at record wides to their corporate CDS: John Deere priced 333 bps wide to its comparable CDS on January 19, and Casino Guichard priced 326 bps wide on January 22. As Felix Salmon of Portfolio.com, pointed out it might make sense to entice the government to purchase these kinds of low- to mid-grade securities and not only in the secondary market via negative basis trades but in the primary market itself, especially as they can be completely hedged thru maturity, and on top of that make regulators happy by purchasing a non-naked CDS-cash bond pair trade. And while the high yield market is not quite as active as the HG market, it is starting to ramp up. So far in January (and this excludes yesterday's $700 million in deals from Chesapeake (BB) and Inergy(B+)), there has been $4 billion issued in 6 deals. This compares to one deal in October (MGM), none in November and two in December (KSU and EP). New issue prices continue to reflect distressed levels, with new issuance spreads over 1,000 bps, and coupons in 8-9% range. One other statistic: all bonds issued in the past 4 months were issued at a discount to par, with January discounts varying from 7-11 pts, pushing yields 200bps from par levels to an average of 11.8%. As for secondary market levels: the HY BB index is averaging about 13.3% yield, while single Bs are at 16.7%. Tim Geithner is moving fast. In this addition to the US Treasury's website made available literally hours ago, he discloses a variety of TARP-related documents that had not been publicly available previously, most notable among them being this disclosure about the Targeted investment program that the Treasury has established w/r/t keeping Citi alive. The following statement is Geithner's justification to maintain a "transparent" view of the financial system "In the coming weeks, we will unveil a series of reforms to help stabilize the nation's financial system and get credit flowing again to families and businesses. Included in those reforms will be a commitment to increase transparency and oversight. Today, we are taking a step toward increased transparency by committing to place all of our TARP investment agreements on the Internet so that taxpayers can see how their money is being spent and the terms these institutions must agree to before we invest taxpayer money." New DTCC weekly change numbers released for week ended January 23. 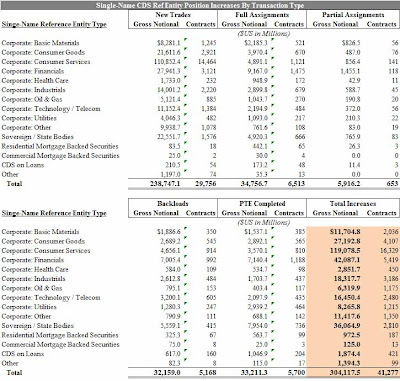 Most notable is the huge gross notional and contractual amount of full terminations of consumer services CDS. Looks like funds are fully covering overhanging shorts. As this has been the most profitable position over the past 3 months it is not too surprising. Based on this technical data, we would recommend establishing short positions in the space due to the diminishing risk of a mass squeeze. Other data indicate that aside from consumer services, risking action has been roughly equally split with derisking in basic materials, consumer goods, health care, tech/telecom, utilities, and other, and only sovereigns have seen a marked rerisking. Today's market action indicates that equities are again chasing credit. It seems there are two sorts of people out there right now: those who say that no matter how much money the government throws at every problem it will never result in hyperinflation, and those that say that hyperinflation is now an inevitability regardless of what actions are taken from here on out. It is likely futile to attempt to reconcile the two groups, but we have decided to present some facts, as well as some statistical data culled by Morgan Stanley. Before that though, we do want to point out the amusing fact that the general media rarely will touch the question of hyperinflation, just like the whole question of are we in a recession or depression - usually the subject is brought up unsolicited. A tangential and rhetorical question is why everyone in this society is so terrified to discuss the real issues that face the economy, and most just opt to skirt around the periphery? What is hyperinflation and can it occur to the U.S.? 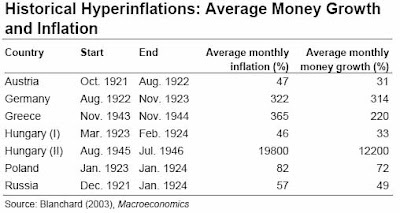 The classical, Philip Cagan definition assumes monthly inflation higher than 50%, and the most recent examples include post World War I Europe (Austria, Russia, Poland, Hungary and Germany, of which the latter recorded over 3,000,000% monthly inflation), as well as Argentina (89-90), Peru ('90), Ukraine ('91-94) and Zimbabwe (past several years). Hyperinflation is caused by uncurbed money supply growth, usually mandated by central banks which are forced to meet excessive fiscal deficits or finance untenable expenditure programs (sound familiar? ), and traditionally occurs in a context of adverse economic and political shocks. Ultimately, it has a psychological manifestation - a loss of confidence in the value of money, a flight into real assets and hard currencies, increase in bartering, a shrinkage in financial intermediation initially and the banking system overall, subsequently. 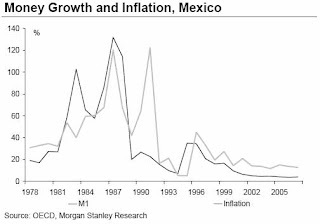 Empirically, hyperinflationary periods are marked by high correlations of money supply growth and inflation rates as seen below. 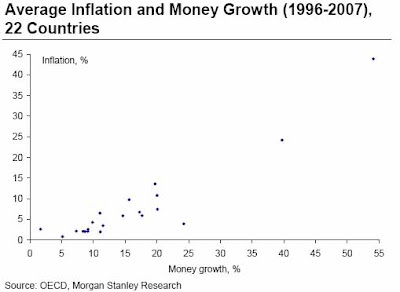 While in low-inflation environments, the money growth correlation is weaker, there is obviously a high statistical inference with higher money growth rates always resulting in above normal inflation rates. So where are we now? According to Haver analytics we are rapidly approaching a point of no return, if we haven't passed it already. 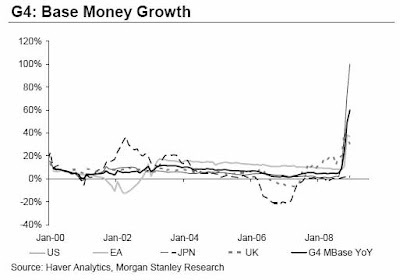 Concerted efforts by the Fed, Treasury, the ECB and the BOE have resulted in an explosion of money growth. The critical question is has this wholesale pumping of M1 funneled into downstream monetary aggregates (M2, "M3", etc) and the general public. Clearly M1 levels are gaining momentum and we have yet to feel the impact of the $825 billion + stimulus package. Furthermore, the government seems hell bent on breaking the dam of money supply at all costs by forcing banks to increase lending, reducing taxes, and generally encouraging currency transfers to the end public. How will the government finance all this increase in money supply: options include central bank loans to the government, buying of government bonds at auction, purchases of government bonds in the open market and additional lending to banks against government collateral. With an increase in monetary supply flooding the consumer now being only a question of time, the psychological element of public confidence will have to be carefully monitored: a surge in inflation would open up a vicious cycle of a loss of confidence by the public and force a reduction in deposits and cash holdings, resulting in purchases of real assets (commodities, select currencies and real estate). At that point the velocity of money and inflation would rise and the central bank would have to keep printing even more money to finance government spending. 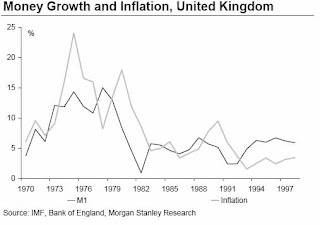 Morgan Stanley attributes a low probability to a hyperinflationary outcome as a result of current monetary and fiscal policy, and assigns to it a mere black swan risk, but regardless believes that "buying some insurance against the event of high inflation or even hyperinflation makes sense and is relatively cheap currently." Our belief is that the worst case outcome is not a fat tail, and is a question not of if but rather when. 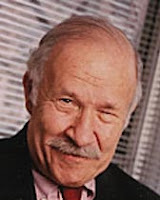 The ironic situation that the U.S. and the entire Developed world has put itself into is that due to the measures taken at fixing the broken financial system, which one could argue were precipitated by the collapse of Lehman, or alternatively, taking a cue from Soros' book, began when the massive credit bubble started some time after Bretton Woods, the outcome of the current period of financial instability, will be a world of even greater financial distress marked by hyperinflation in most western countries. As we have argued before, and as evidenced by today's FOMC statement, the Fed is now toothless in its monetary policy (0% rate floor, when it should ostensibly be negative, in order to maintain an appropriate rate of economic expansion and inflation) and, by purchasing treasuries is now commencing its involvement in pseudo-fiscal adjustments. This adds more ice to the slippery slope of M3 exploding in our faces, at a time when the central bank is still fighting to prevent the consequences of 10%+ unemployment and an effective shut down in consumption from impaling U.S. GDP. (there is, of course, the export component of GDP, but I think we are in for a slew of negative surprises on that front as well very very soon). For monetary policy sticklers, we have provided the most recent version of the Fed's H8 report where one can see the rather violent increase in the M3 proxy (either total assets or total liabilities, opinions differ). It is a safe bet that the total amount will only continue increasing in the coming months. What can investors do to protect themselves from eventual (hyper) inflation? As specified above, "hard assets" are a safe bet. TIPS, shorting treasuries, purchasing currencies of those countries that are not expected to have huge deficits and/or untenable leverage, commodities (we still like our "risk free" profit idea, although the contango now has collapsed, so if you did it at the time, props to you), others? While the alleged pessimism that we sometimes exhibit may be too much for some readers, we only try to present both sides of the coin, and to help as many people preserve capital. Over the next 2-3 years, this will be a very difficult task, absent amusing days like today when the market is up 3% on patently horrendous news. The real first black president (David Palmer) couldn't save this one. *ALLSTATE 4Q OPER INCOME PER SHARE 97C; ANALYST EST. $1. With almost half the S&P having reported their earnings, we know all too well how bleak the employment picture is with a daily barrage of "streamlining" bullet points in each company's earnings press release. Another interesting factoid is to compare the estimated earnings growth rates of different companies by sector, whether based on company guidance or consensus estimates. 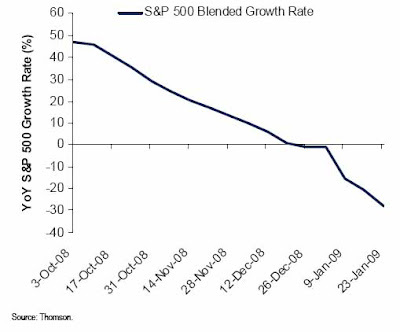 What is surprising is the nearly 80% drop in the estimated growth rate for the S&P500 from only 3 months ago. One can accuse sell side analysts (and management teams goaded by ebullient PR firms) of many things, but being realistic is probably not one of them. On the next graph the relative growth rate estimates for the market by sector are shown. All those people saying the bottom in financials is here and today is the last day to buy at bargain prices, we suggest you take a look at the far right column. 5 comments Links to this post Labels: -28% Growth Rates, Is The Bottom Here Yet? Breaking on CNBC: Republicans to present alternative stimulus plan which will "create double the amount of jobs in the currently proposed plan." Enter stage left: partisan wrangling. I assume I am not the only one watching the big game of roulette on CNBC right now (i.e. the market). For all those clicking the buy button on E-Trade with the reckless abandon of Gary Busey doing... well, anything he does, we want to point out this interesting analysis on FT Alphaville. Tracy Alloway has looked at capacity utilization in two of Europe's largest economies, France and Italy, and the punchline is :"France utilization fell to 75.8 in January from 82.2 in October - the biggest decline ever seen. In Italy the same - utilization feel to 69.9 from 74.4 in October." However the January number really indicates data only thru the end November. JP Morgan says "on the basis of capacity utilization, output fell very, very dramatically in December and January. Furthermore, this collapse in capacity utilization suggest a big decline in capital spending and inflation in the months ahead." 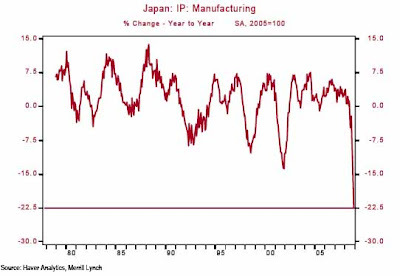 "Capacity utilization plays a critical role in our thinking about the Euro area. Given the lags in the production of the official output data, it influences our view of high frequency developments in production. Because the denominator is influenced by the capital stock, the level of capacity utilization seems to play an important role in capital spending decisions. It is a key determinant of pricing power and thus it is very significant in our Phillips curve for the region which drives our core inflation forecast. And, last but not least, it plays an important role in our ECB forecasting tool, as it influences the appropriate policy rate." It The Boston Consulting Group and Nassim Taleb are right, and the latter has been right over the past 2 years where everyone else has been massively wrong, then private equity firms are about to get in line for government bail outs. In a study by BCG, as many as 40% of the biggest 100 buyout firms may collapse over the next 2 years "as their debt-strapped assets default." We are trying to get some more color on whether any specific firms were actually named (some potential guesses here). 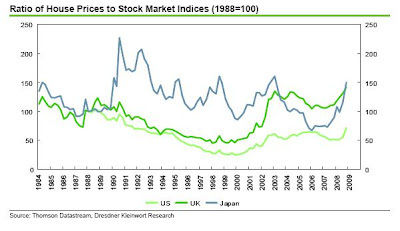 "Don't focus on the drawdown... The market will rebound...Look for the ephemeral truth." - Financial services sector is expected to offer the most opportunities for distressed investors. Auto manufacturers and suppliers may be the most lucrative sector for investors in 2009. Opportunities are expected to be spread relatively evenly throughout other sectors, reflecting the breadth of the recession. - 73 percent of respondents predict an overall decrease of the liquidity in distressed debt trading. As the consolidation among banks and fund closures in 2008 are expected to carry over into 2009, competition for positions will be cut, allowing new funds to push into the market. Investors likely will continue to see a buyers' market in 2009, allowing them to be more selective with where they commit their capital. - 2008 saw a 23 percent increase from 2007 in respondents who did not use hedging strategies. With significant declines across all markets in 2008, most hedging strategies proved ineffectual, with 34 percent of respondents not using any hedging strategies. The use of credit default swaps as a preferred strategy dropped 6 percent in 2008 from 2007. - Fewer respondents used leverage to manage their fund in 2008 compared to 2007. Out of those who did, 49 percent plan to use less in 2009. - More than half of the survey respondents believe the recession will stretch through at least the first half of 2009, while 35 percent think it will extend through the end of 2009, making it the longest on record since 1933. - Heading into 2009 the appetite for primary deals has shrunk, with approximately 10 percent of respondents planning to allocate 10 percent or less to the primary.